This former Wild town has now been transformed into a normal run-of-the-mill town complete with a state-run casino. There were several statues commemorating the town’s history – a large steer, cement cowboy and Wyatt Earp – but the town today is a depressing mix of run-down streets and empty storefronts. Not what we were hoping for at all. After getting settled in at the lovely Boothill Bed and Breakfast (HIGHLY RECOMMENDED), we toured the town, visited the sites and had a dinner and show at the Boot Hill Museum. And, once we’d exhausted the town’s offerings, we popped down to the casino just west of town, Boot Hill Casino. It was actually quite nice featuring all the standard table games as well as poker and slots. Sorry pal, we don’t know. Maybe these sepia toned images will help. 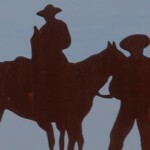 The famous Boot Hill Cemetary – got its name from the many cowpokes buried in their boots. Entrance to Boot Hill Museum. Kimmer with El Capitan, a Texas Longhorn in honor of cattle rustlin’ days past. Guilty as charged. I’ll be back with a posse. Boot Hill Museum – Main Street. Sadly, the only place to see a gunfight these days. Old Cowboy – full image. Old Cowboy Statue – modeled after a local dentist. Caption below the cowboy statue. Wyatt Earp at the ready!